Novelty must be a harsh mistress. She demands so much that there is little left of the people who serve her. This is a problem for pop-conceptualists like Ricky Swallow, whose watercolours at Darren Knight Gallery try a little too hard to be a little bit novel, and are only a little bit clever. 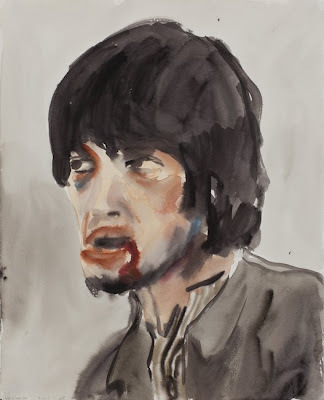 The exhibition is made up of a series of what you might describe as 'imaginary portraits', effectively watercolour studies of images from movies or other painters. As an exercise in doodling it's quite persuasive, but as a coherent piece from a critically and commercially successful artist it's a weak pastiche. The dominant images are those of 'Ned Kelly' and his gang. 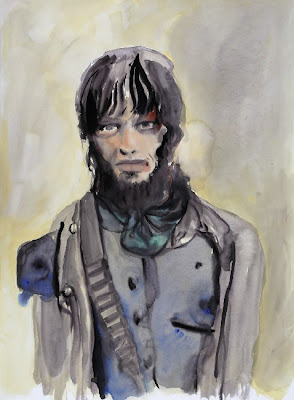 That is 'Ned Kelly' as played by Mick Jagger in Tony Richardson's 1970 film. The layers of reference and irony are laid on by the spadeload. We think of Sydney Nolan's Kelly series and of Andy Warhol's multiple screenprints of Jagger, and it's hard to imagine that we're not supposed to. Swallow is accomplished, he captures the gangly sullen vulnerability that makes Jagger's casting in the film interesting (but never managed to do the same for the film itself). Washed out in greys and browns, with Jaggers mouth a smeared scarlet scar the paintings are ugly beautiful. They're also painfully pointless. Swallow's nods toward the painterly are just as obvious. 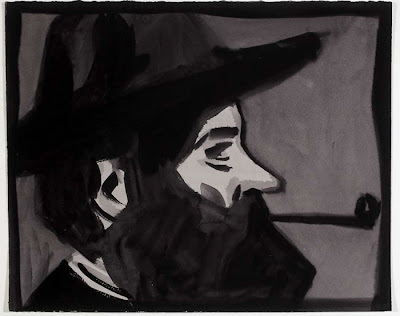 He aims for Barcelona period Picasso, in a set of six bearded men who look equally like Van Gogh sketches. He appropriates style and captures it, but for no apparent reason. His 'Hooded Woman', a 'blue-period' homage is similarly well executed, finding that other worldliness that Picasso sought, but again it's hard to see why you would do it. The stylistic reference is so direct that it feels more like an eager to please child showing off than an artist seeking something in his predecessors. The feeling of desperation that comes from so many references worn so heavily is a hard one to get past. It's like a joke taken too seriously, as it comes with theoretical justification included. If all conceptual artists, and it's hard not to label Swallow as a conceptualist when so much of his work relies on the manipulation of external meaning, then Ricky Swallow's is rendering pop cultural artifacts in a 'fine art' style, whether it's watercolours or his accomplished sculpture. It's perfectly post-modern, high art-lite, and fine tuned to push all the right buttons of critics. The problem is that the the depth of meaning is pretty shallow, once you get the ironic juxtapositions that's it. This might be enough to make someone feel mildly clever but it doesn't make for anything emotionally or intellectually satisfying.